Los Angeles Theatre Center (LATC). 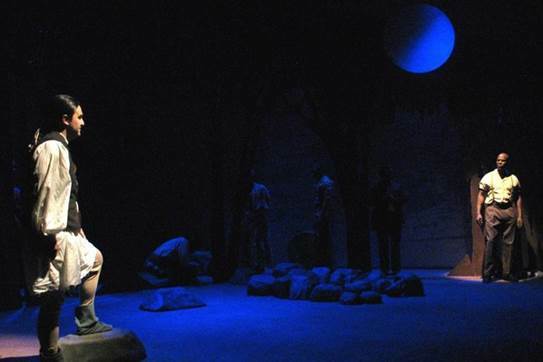 Marcus Gardley’s the road weeps, the well runs dry presented at the Los Angeles Theatre Center (LATC) combines history, myth, sexual variance and magical realism. Like his earlier work every tongue confess, this play is epic in scope sketching multi-generation characters in a confluence of the real and the metaphysical. Gardley uses ethnographic research and historicity to substantiate a community of black Seminoles relocated by the American government to what is now present-day Oklahoma during the mid-nineteenth century. 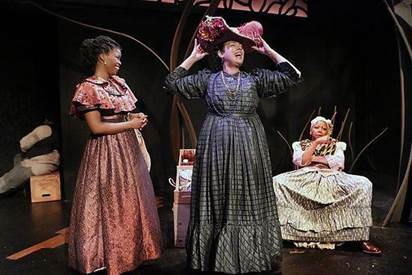 This in itself may not be that unique to the African-American dramatic canon but Gardley’s play is told from the perspective of his male leads involved in an intimate relationship. Though the work does not wholly lend itself to the moniker of “gay” play, a vital conversation is to be had from its relevancy. Tensions that arise from the literal and figurative combative forces of the “natural” and the “unnatural” are seen to have dire consequences on the community’s existence as the townspeople pursue grievances fueled by jealousy, bigotry and envy. An intricate number of characters are introduced; some black, some Seminole, some mixed. But the story rests on the conflict between Number Two and Trowbridge. It is their intimate spiritual connection that sets the tone for the ensuing struggle between the orthodox and the transgressive. 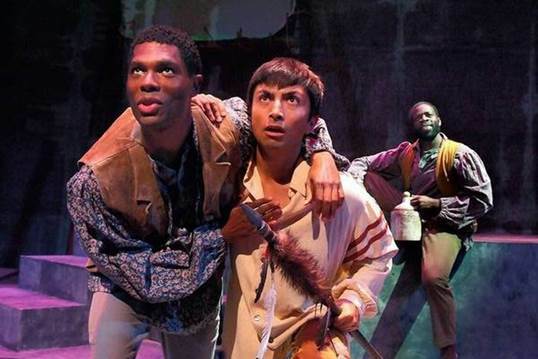 The two men meet as young boys; Number Two, a runaway slave encounters Trowbridge, a Seminole, on his vision quest. Their relationship deepens as friends and then as lovers. Adhering to social realities, the men marry women and have children. When they become the civic leaders of a “freetown,” Trowbridge is made sheriff and Number Two becomes his assistant. Out of an unrequited passion for Trowbridge that he cannot accept, Number Two murders Trowbridge’s son when he overhears his plan to elope with his daughter. He disposes of the son’s body by throwing it down the town’s well and a drought ensues. Afterwards, the men’s wives and relatives as well as the townspeople become complicit in a series of bitter acts to exorcise the evil curse. Unbridled fury, divided loyalties, secrets and lies drive the generational narrative cycle of revenge. Dramaturgically akin to Greek tragedy, it is interesting to observe these characters that do not possess the stature of gods succumb to the same hubris responsible for the suffering and downfall of those ancient exalted beings. Director Shirley Jo Finney’s staging draws on tropes of Greek, African and indigenous ritual to effectively enhance the theatricality. Events unfold on a cavernous playing area dominated by a ceremonial mound that acts literally and metaphorically as the community center and the “liminal” space of destiny occupied by inhabitants of differing cultures. Abstract Corinthian columns projected onto a screen accentuate the Greek reference as a chorus composed of the townspeople surrounds the audience with chants, songs and verse. Gardley’s signature poetic language resonates in the spectator’s ears. Moving the actors about the performing space from upstage to downstage in a movement reminiscent of a waterfall, Finney establishes a rhythmic back and forth in body language as they circle each other in patterns that recall stalking movements of hunter and prey. A trapdoor center stage becomes the entrance to the well. Each time it is opened the lights within burn blood red as if it were the gateway to hell. Above the stage a huge sage brush dangles, symbol of the parched land. In contrast to this scene of aridity are the fecund African American and Native American skin tones of the actors, rich and sensual. Earth and flesh congeal while an invasive mysticism casts a spell as weapon and balm to locate the ultimate arbiter to end this tribal retribution. Precisely for its agitation in telling the story of this little known community from the perspective of those who have the most to lose in the telling of their secrets, the road weeps, the well runs dry is amongst the best in the emergent African American dramaturgy where queer identity is examined. As black gay visibility in the global media increases, the play accomplishes a creative framework where heterosexual and queer can always already be included in the modern dramatist’s mise en scène. 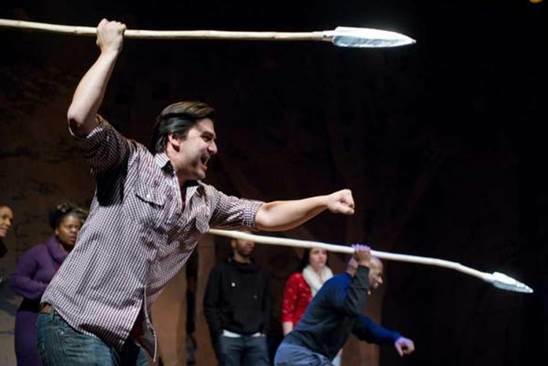 We progress from a conservative tradition of separate narrations of people of color and queers of color to boldly depicting the actual political, social and cultural overlap that forges communities, bringing a new awareness to this relatively unchartered territory of American intercultural theatre.